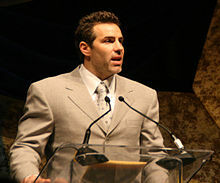 Kurt Warner during a 2007 speech. Kurtis Eugene "Kurt" Warner (born June 22, 1971, in Burlington, Iowa) is a retired American football player. He was the quarterback for the Arizona Cardinals. After playing in college at Northern Iowa, he was signed by the Green Bay Packers as an undrafted free agent. He was not able to play there, so he went to the Arena Football League, and then later the NFL Europa. In 1998, Warner was signed by the St. Louis Rams. After the Rams’ main quarterback Trent Green went out with an injury, Warner became the main quarterback. He later went on to win NFL MVP awards in 1999 and 2001, as well as the Super Bowl MVP award in 2000. In 1990, Kurt graduated from Regis High School in Cedar Rapids, Iowa. While there, he played quarterback of the school's Class 3A football team. He announced his retirement from football on January 29, 2010. Warner (center) and his wife Brenda (left), with former teammate Amani Toomer (right) visited a sick Indonesian boy. After Warner graduated from high school, he went to the University of Northern Iowa (UNI). At UNI, Warner was third on the Panthers' depth chart until his senior year. In his final year there, he was able to start and was named the Gateway Conference's Offensive Player of the Year. While at college, he met future wife, the former Brenda Carney Meoni. They got married on October 11, 1997. Before this, Brenda had served in the Marines. She was divorced with two children when they met each other. Warner adopted Brenda's two children, son Zachary and daughter Jesse, after their marriage. Zachary is blind from the head injuries he got when he was accidentally dropped by his birth-father as a baby. Warner agreed to help Brenda raise the children. The Warners now also have five children of their own: sons Elijah and Kade, daughter Jada, and twin girls Sierra Rose and Sienna Rae. After being let go from the Green Bay Packers training camp in 1994, he got a job working the night shift at a local Hy-Vee grocery store. He was also assistant-coaching at Northern Iowa. Warner still wanted to play in the NFL, but with that not seeming it was going to happen, and the long hours at the Hy-Vee for minimum wage creating financial trouble for him, Warner began playing in the Arena Football League. In 1996 and almost a year before Kurt and Brenda's marriage, Brenda's parents, Larry and Jenny Carney, were killed when their Arkansas home was destroyed by a tornado. On October 24, 2006, Warner was in a political advertisement against a proposed law in Missouri. That new law would allow embryonic stem cell research to be done in Missouri. Warner was in the advertisement with James Caviezel, Patricia Heaton, Jeff Suppan, and Mike Sweeney. The advertisement, which was played during Game 4 of the 2006 World Series, falsely alleged that Amendment 2 would allow human cloning. The advertisement came after a pro-embryonic research advertisement that had Michael J. Fox, who has Parkinson's disease, in it. Warner went to the Green Bay Packers training camp in 1994, but was released before the regular season began. He returned to Northern Iowa and worked as a graduate assistant coach with the football team but he still wanted to get a tryout with an NFL team. When no NFL team would give him a tryout, Warner began playing for the Arena Football League. In 1995, he signed with the Iowa Barnstormers. Warner was named to the AFL's All-Arena first team in both 1996 and 1997. He led the Barnstormers to the Arena Bowl in both 1996 and 1997. Some people consider Warner one of the greatest Arena Football player of all-time. In 1997, Warner was offered an NFL tryout by the Chicago Bears, but he could not attend the tryout. In 1998, he was signed by the St. Louis Rams, but he only played for NFL Europe's Amsterdam Admirals. Warner was the backup quarterback for the St. Louis Rams during the 1998 regular season and the 1999 preseason. When their main quarterback Trent Green was injured in a preseason game, Warner became the starter. He had one of the best seasons by a quarterback in NFL history by throwing for 4,353 yards with 41 touchdown passes and a completion rate of 65.1%. The Rams' very good offense was nicknamed "The Greatest Show on Turf." In the first three games that he was the main quarterback who plays, he threw three touchdown passes in each game. He is the only NFL quarterback in history to do that, and only the second, behind Dan Marino, to do it in his first two NFL starts. Because not many people knew who Warner was, Sports Illustrated put him on their October 18, 1999 cover with the caption "Who IS this guy?" He was named the 1999 NFL MVP at the end of the season. In the NFL playoffs, he led the Rams to a Super Bowl XXXIV win against the Tennessee Titans. He threw for two touchdowns and a Super Bowl record 414 passing yards. He also set a Super Bowl record by throwing 45 passes without an interception. Right after the Rams' Super Bowl win, an interviewer asked Warner, "Kurt, first things first--tell me about the final touchdown pass to Isaac." He responded, "Well, first things first, I've got to thank my Lord and Savior up above--thank You, Jesus!" He was awarded the Super Bowl MVP. That made him one of only six players to win both the league MVP and Super Bowl MVP awards in the same year. The others are Bart Starr in 1966, Terry Bradshaw in 1978, Joe Montana in 1989, Emmitt Smith in 1993, and Steve Young in 1994. Warner also played well in the 2000 season. Warner and Trent Green both played quarterback that season, and they both played well. But the Rams lost in the wild card round of the playoffs to the New Orleans Saints, mostly because their defense was not very good, even though Warner and the rest of their offense was still very good. Nine of the Rams' eleven defensive starters were cut in the offseason, and Green was traded to the Kansas City Chiefs. Warner played very well in the 2001 season. He had a league-high 36 touchdown passes and 4,830 passing yards with a career-high completion rate of 68.7% of his passes. He led the Rams to an NFL-best 14–2 record and they went to the Super Bowl XXXVI, but they lost to the New England Patriots. He was named the NFL MVP for the second time at the end of the season. Warner began the season 0–3 as a starter, throwing seven interceptions with only one touchdown. In their fourth game against the Dallas Cowboys, he broke a finger on his throwing hand. Even thought he tried to come back later in the season, his injury caused him to be able to play two more games, and he lost them both. In contrast to his 103.4 career passer rating before that season, he had only 67.4 rating in 2002. He was replaced as the Rams' main quarterback after he fumbled six times in the opener of the 2003 season against the New York Giants. His replacement as the Rams quarterback, Marc Bulger, has been named to two Pro Bowls. The Rams released Warner on June 1, 2004. Just two days later, he signed a two-year deal with the New York Giants. He began the 2004 season as the main quarterback. He won five of his first seven games, but after not playing well in a two-game losing streak, rookie quarterback Eli Manning was made the main quarterback. Giants coach Tom Coughlin later said that he never should have made Warner play, and should have played Manning from the beginning to give Manning the experience he needs to build his confidence. The Giants had a 5–4 win-loss record at the time that Manning began playing, and they finished at 6–10 overall (going only 1–6 under Manning). In early 2005, Warner signed a one-year, $4-million contract with the Arizona Cardinals. He was soon named the main quarterback by coach Dennis Green. He played bad in three games before injuring his groin. He was then replaced by former starter Josh McCown. McCown played well enough in two games during Warner's injury to get coach Green named McCown the starter for the rest of the season. As Warner was the backup quarterback, many people thought that he was never to be the main quarterback again. But because McCown played bad in two straight games, coach Green made Warner the main quarterback. He played well in the next three weeks, but his season ended in Week 15 when he partly tore his MCL. Warner signed a new three-year deal with the Cardinals on February 14, 2006. The deal had a base salary of $18 million, but if he played well, he could get as much as $22 million in the three years. In Week 3 of the 2006 season, Warner passed the 20,000-yards passing milestone in his 76th game. That was one game more than record holder Dan Marino, but Warner did it in his 9th year while Marino did it in his 5th. After Matt Leinart played poorly in the three games of Weeks 2-4, Warner replaced the rookie Leinart in the fourth quarter of Week 4. In Week 16, Leinart had a shoulder injury against the San Francisco 49ers, so Warner was able to play for the first time since Week 4. He did well that game, and the Cardinals won the game. In the third game of the 2007 season against the Baltimore Ravens, Warner came off the bench because Leinart was again not playing well. He led a comeback, completing 15 passes out of 20 attempts for 258 yards and 2 touchdowns. This brought them to a tie game (23–23), but after the Ravens made a last second field goal, Arizona lost the game 26–23. On September 30, 2007, during the Week 4 game against the Pittsburgh Steelers, he went in for Leinart because he was not playing well again. Leinart was later placed on Injured reserve, so Warner was named the starter for the rest of the 2007 season. Warner got 27 passing touchdowns in the 2007 season, just one short of the Cardinals franchise record. Because he played well, he was given a $1 million bonus for the year. His 3,417 passing yards, 27 touchdown passes, and 89.8 passer rating were all his best since the 2001 season. Matt Leinart was named the Cardinals starter going in to the off-season for 2008, but Ken Whisenhunt said that it may happen that Warner become the Cardinals' starter before the season begins. Warner was named the starter on August 30, 2008. That season, Warner had a very good season, and on December 16, 2008, was named the starting quarterback for the NFC team in the 2009 Pro Bowl. Warner and the Cardinals won all three of their playoff games, but lost in the Super Bowl to the Pittsburgh Steelers. That makes Warner's Super Bowl record 1–2. James Dobson, starter of Focus on the Family, has been supportive of Warner, and even replayed a radio clip of Warner and his wife on January 30, 2009. ↑ "Kurt Warner Career Biography and Statistics". Retrieved 2008-07-06. ↑ "Kurt Warner at Scout.com". Retrieved 2008-07-06. ↑ "The Arizona Cardinals QB is no fair-weather follower". Retrieved 2008-07-06. ↑ "Super Bowl XXXIV MVP: Kurt Warner". Retrieved 2008-07-06. ↑ "Cedar Rapids Regis High School scores again". Retrieved 2008-07-06. ↑ Baum, Bob. "Warner brings end to stirring 12-year NFL career". Retrieved 2010-01-29. ↑ "Kurt Warner Career Highlights". Retrieved 2008-07-01. ↑ "Kurt Warner's Testimonial". Retrieved 2008-07-06. ↑ "Inside Game: Kurt Warner". Retrieved 2008-07-08. ↑ "Kurt Warner the ArmChairGM". Retrieved 2008-07-06. ↑ "Kurt Warner: First Things First". Retrieved 2008-07-14. ↑ "Biography for Kurt Warner (by IMDb)". Retrieved 2008-07-09. ↑ "Warner Lends Name to Anti-Stem Cell Ad". Retrieved 2008-07-06. ↑ "Stem Cell Opponents To Air Celebrity Ad". Retrieved 2008-07-05. ↑ "Michael J. Fox, meet Kurt Warner". Retrieved 2008-07-06. ↑ "20 Greatest Players in AFL history revealed". Retrieved 2008-07-19. ↑ "Kurt Warner - Warner, Rams Rise". Retrieved 2008-07-19. ↑ "History of NFL Europe". Retrieved 2008-07-19. ↑ "SI.com - Oct. 18, 1999". Retrieved 2008-07-13. ↑ "2000 Super Bowl XXXIV". Retrieved 2008-07-13. ↑ "Statistics by player passing". Retrieved 2008-07-13. ↑ "Kurt Warner's Testimony". Retrieved 2008-07-14. ↑ "2000 New Orleans Saints season". Retrieved 2008-07-13. ↑ "Greener pastures: Green traded". Retrieved 2008-07-13. ↑ "Super Bowl XXXVI New England 20, St. Louis 17". Retrieved 2008-07-13. ↑ "NFL Most Valuable Player/Player of the Year". Retrieved 2008-07-13. ↑ "Warner Out 8-10 Weeks Because of Finger Injury". Retrieved 2008-07-13. ↑ "Marc Bulger". Retrieved 2008-07-13. ↑ "New York Giants Schedule - 2004". Retrieved 2008-07-09. ↑ "Kurt Warner: Injuries". Retrieved 2008-07-12. ↑ "Fox News on Kurt Warner's salary". Retrieved 2008-07-11. ↑ "2008 contracts: Kurt Warner, QB". Retrieved 2008-07-11. ↑ "Kurt Warner Career Highlights". Retrieved 2008-07-13. ↑ "Dan Marino - Selected Writings By Marino:". Retrieved 2008-07-13. ↑ "Leinart is Cardinals' starter at QB, but Warner will push". Retrieved 2008-07-13. ↑ "Green May Bench Warner for Leinart". Retrieved 2008-07-13. ↑ "Week 16 Game Recap". Retrieved 2008-07-13. ↑ "Baltimore Ravens All-Time Results And Statistics". Retrieved 2008-07-13. ↑ "Arizona Cardinals Regular Season". Retrieved 2008-07-13. ↑ "Leinart out for the season; Cards sign Rattay as backup to Warner". Retrieved 2008-07-13. ↑ "Kurt Warner Career Statistics". Retrieved 2008-07-13. ↑ "Pro Bowl Rosters (cont.)". Sports Illustrated. December 16, 2008. Retrieved 2009-02-02. ↑ Malcolm, Andrew (February 1, 2009). "James Dobson goes with Arizona today, especially Kurt Warner". Los Angeles Times. Retrieved February 1, 2009. ↑ "An Incredible Football Journey". Focus on the Family. January 30, 2009. Retrieved February 1, 2009. ↑ "Kurt Warner #13 QB". Retrieved 2008-07-06. ↑ "All Things Possible book review". Retrieved 2008-07-19. Wikimedia Commons has media related to Kurt Warner.